Tonight I did the unthinkable. After working a 13 hour day and driving over 250 miles, I decided to go shopping. In Salisbury. The Crossroads of Delmarva. The home of all the big box stores, chain restaurants, movie theaters... Chuck E. Cheese - and the Mall. Salisbury is a Mecca of retail chaos. Granted I love this place, but not after work, with a headache, no dinner ... feeling like I want to hurt somebody. It was a recipe for disaster. But, my little grandson's first birthday is tomorrow, and this was my only chance to buy his present - a toy box. Toys R Us had it.... Toys R Us .... in December... I'd rather pour boiling water in my eyes. Well, I figured as long as I had to endure the pain of the toy store, I might as well hit Macy's and pick up Lara's gift - and pop into Boscov's and buy my Christmas floor mats. (These were not impulse buys, but needed stuff ... the last things on my Christmas shopping list). Came out of Macy's with 5 things for me and Lara's gift. So I over spent a little - actually four times what I expected to spend. But the decorations, and music and Martha Stewarts sweet face behind that red and green Christmassy kitchenware got me in the mood ... to buy. So I did. I went to Toys R Us and came out with Tristan's toy box and two things for me - okay, they were a pack of pretzel M&Ms and batteries - but still more than I planned. Then, feeling pretty good, I went into Boscov's department store. It was all decked out in Christmas stuff. The floor mats were 50% off. So I picked up four - two for the kitchen, one for each bathroom. Then I got a Christmas garden flag and a box of lights. The girl at the check out was nice. She rang up the sale - $42.61. I gave her my credit card and she examined it. She said, "Do you have your ID because your signature is rubbed off." I don't carry a purse into stores. I have pockets. I carry my government issued blackberry and my personal iPhone, my car key and my credit card - in pockets. I abhor schlepping a bag around. I said, "No, I don't carry a purse. But look... here's my state issued blackberry" - I clicked to the settings where my name comes up. "See? There's my name." She wasn't impressed. So I pulled out my iPhone. A manager approached the register. "Look, here's my Facebook profile - see my picture and my name?" Then I flipped to the Internet and pulled up two (of my four) bookmarked blog sites that have both my name and my photo... then over to my CBS news blog. The manager looked at me with disdain. How dare I ask for an exception. Who did I think I was? One more time I tried ... "For God's sake, I'm all over the freeking Internet." To this the manager replied, "Our policy is to require ID if the credit card doesn't have a signature." Shame on you, Boscov's. You've reduced your staff to being robotic non-thinkers who aren't authorized to assess a customer's credibility or weigh the cost of sending a frustrated customer away angry, against the cost of possibly defrauding Boscov's of $42. Why didn't I have trouble with a non-signed credit card at Macy's or Toys R Us? Because they never handle the cards. Like Target and Bed Bath and Beyond, Barnes and Noble - and even WalMart, these stores have the customers handle their own cards right with an ATM type device right at the checkout counter. 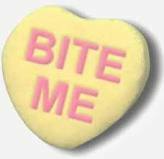 So when the Boscov's cashier suggest I walk to my car, get my ID and return to the register where they would be happy to take care of the transaction - I replied .... wait for it ...... "Bite Me!" I didn't scream it or say it even disrespectfully. I said it in a nice kind of way - sort of smiling. Like .. "Bite me .. and Merry Christmas to ya' ... I won't be shopping here." Boscov's, I wish it was as easy to shop at your store as it is to shop at the other chain stores. I wish you'd empower your managers to make exceptions for people who can reasonably prove identity through sources other than the photo ID. I wish you were more customer service oriented. And, I wish I had my damn bath mats. 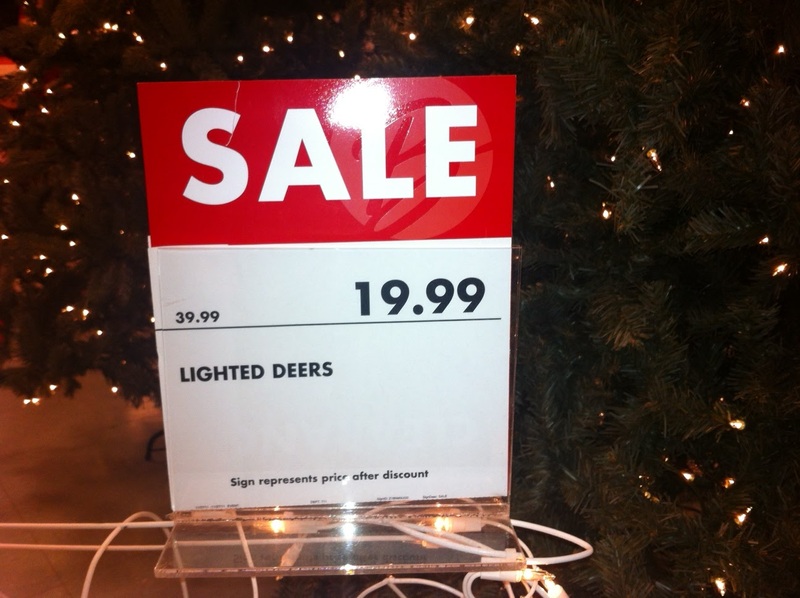 Oh....yeah, Boscov's.... you might also consider hiring a marketing editor. A couple of years ago, Bob Dylan was walking along a street in N.J. not far from my home town. Being Bob Dylan he looked creepy and possibly senile and lost. A cop pull over to the side of the road, got out and asked him for ID. He said, "I'm Bob Dylan" The officer said, "OK, Mr. Dylan, can I see some ID?" He didn't have any so they took him to the station until someone could come and prove who he was. Also: and just for fun. Sometimes my wife sends me out with her card ('cause editors don't make nearly as much as you'd expect). I always get a kick out of signing the receipt Arnold Washington. On the wall in the kitchen I have a small collection of the ID badges they make you fill out when you go into schools. My prized one says "Osama Bin Laden". I printed it at Delmar elementary and roamed the halls with it for hours. I'm in no way defending Boscov's but, when you think about it, the kind of people who can be relied upon to use sound judgement tend to work other places. Following rules into absurdity takes a special kind of person. I don't carry a purse either. I would only put it down somewhere and leave it and then I am the only one I can be annoyed with, so then there is no place to put that negative energy. I know this because I have done it, more than once. Having to get a new license, credit cards, and losing your cash is annoying. So I use my back pockets - my card in one, my phone in the other, and my keys in my jacket. Lord & Taylor and Marshall's are the only places that give me a hassle, because now your card, even if it is signed, isn't enough. They want your license. Well, that's back in the car, in my purse, so when I am speeding on my way home because I am so frustrated because I left my stuff that I wanted to buy at the counter because their "rules" were more important than a sale and a loyal customer, I will have my license. Better to have it for the Trooper than the cashier, I say. Sadly Mindie, after too many years of more than painful,'big box store' shopping experiences, I have learned that online shopping coupled with 'overnight shipping' if needed, are the way to go for me. That, or wind up having to take extra BP meds and risking a night in jail (very unbecoming for an old woman). The exception, of course, is shopping in your hometown - where they already know your face! As an economic development professional, I make my living helping rural businesses. And like you, Sue Beaman, I do most of my shopping on line... though I'm embarrassed to say so, because I want to help local businesses - even the big box stores because our "local" people work in them. Those jobs are important. But it's exciting to see how many of the big box stores are facing that competition of "one click" shopping, and making it easier (and fun) to shop - like the ones mentioned in my post. I actually enjoyed my shopping at Macy's and stayed longer and bought more than I expected to. Kathy (Clough) mentions above that Marshall's and Lord & Taylor - (like Boscov's) are still clinging to policies that make sense for decreasing loss ratios - but drive customers to their desks where online merchants roll out convenience out like a red carpet spattered with discounts, freebies and no shipping charges. All I asked of Boscov'e was to allow managers to use common sense. Clearly, I offered some good proof that I was Mindie Burgoyne, and I was only spending $42. Also ... I DID mention and prove via my iPhone that I had 4 blog sites. Wouldn't that be a red flag? Do you really want to offer a blogger more material? And, of course Tony Russo makes a valid point. Fraud is still an issue. In most of these stores, anybody can use anyone's credit card. Kids steal their parents' cards and run up bills, and the new "convenient" systems where the clerks don't touch the cards makes fraud easy. But somehow the stores that are making it easy are growing and adapting. Boscov's and their ilk should learn from them. I dont carry a purse ever but i do carry my id u need it everywhere even if u have to go to the emergency room!! deal with it! I did have my ID. In the car. By the way. If I collapsed in Boscovs, my credit card would be enough for them to trace my personal information. Otherwise, I'd be all ID'd up once I got back to the car. And wow! - three exclamation points in your comment!!! Feeling strongly about this? For those of you that are not up on the latest schemes by criminals, Identity theft via credit is the hardest hitting non violent crime affecting people today. When you discover that someone has stolen your ID/credit card or credit card number and put it on a fake credit card and then you find that you have all these bills coming to you that you did not purchase. Then you will thank those cashiers that are aggressive at protecting your credit. I spent three years with police reports cleaning up my credit. As an Economic Development Professional you should well know about the hightened state of alert of ID theft and Credit fraud affecting our economy and the lives of those hit by it. Maybe you should update your training or just stop being arrogant and shrewd. Wow, girlfriend (or guyfriend - can't tell because you're hiding behind Anonymous) ... if you're not an Economic Development Professional yourself, you should probably refrain from throwing stones. Secondly, if you read the post, you would see that it was not a credit card it was a check card. There are no bills. Thirdly, the vast overwhelming members of the retail sector, have moved to the electronic devices that are at the counters where customers scan their own cards. Since this implementation, there has actually been a DECREASE in credit card fraud. Fourthly (is that a word) I guess it takes one to know one Ms (or Mr.) Shrewd and Arrogant. But this is my blog and the title speaks for itself. I'm sorry that your identity was stolen - sincerely sorry. But don't let your emotions cloud your understanding of today's trends in commerce. Boscov's is behind in both technology and management which in turn, puts them behind in customer service. "But this is my blog" sounds rather childish. Why don't you hand that unsigned card, "it was not a credit card it was a check card" (Big difference, in the long run its still YOUR money) to the nearest dishonest person, and let them visit all the stores where you can handle your own card and have a field day with YOUR money. I thank stores like Boscov's for making sure "my card" is my card. It's done for my protection. And you mention your iPhone and 4 blog blog sites enough in this "blog". Braggy, braggy. I ACCIDENTALLY came across this page. So stop trying to sound like you're someone big and mighty. Come off your high horse and get a life! Maybe while you're at it someone will steal your idenity and youll learn to appreciate someone trying to look out for you..
Dear Anonymous. You throw out the criticism pretty quick with no identity - no name to go with you dramatic judgements. And for accidentally coming across my blog, you've come back twice now to a very old post that doesn't rank high anymore. As a blogger, I want people to be able to say what they think. Which is why I'm happy to leave your anonymous comments for all to read. But I'll not be drawn in anymore to your drama. It's not Boscov's policy. It's federal law to check a government issued photo ID if a credit card is not signed. Not signing your card means that you WANT the cashier to check and avoid identity theft. You probably didn't get asked at Toys R Us or Macy's because of careless workers or because those stores have a debit system on their registers, which Boscov's does not. Next time, have an ID or have your card signed. And the fact that you literally said "bite me" to a cashier at the mall who was only doing their job, probably overworked and stressed from the Christmas crowds, is sickening. Wow... yet another Anonymous slam. Wonder if you're the same "Anonymous" that from the previous comment. I'll off the same comment back. READ the post. Then go out and find a friend who can give you the love you need so you don't have to be so sour and snappy on Christmas. Sorry if I sounded "sour and snappy." That honestly wasn't my intention. Also, I used anonymous because I don't have an account on this site and my phone doesn't give another option. My name is Sam, and no, I am not the other person you're referring to. I did read the post, and I am not "slamming" you. I'm simply telling you a fact: that it's federal law they were following, that the store clerk was just doing her job, and that it was frankly very rude of you to say "bite me" to her for doing so. I've had my card stolen and used in spite of the "please see ID" written in bold on the back of it, and I wish more cashiers were as attentive as Boscov's workers are. It would have saved me a lot of hassle. It's state and US policy I believe to require ID. The store, cashier and manager did nothing wrong. Write to corporate. And "anonymous" is absolutely right- you were being rude. You were actually being a "b" word. She was doing her job.